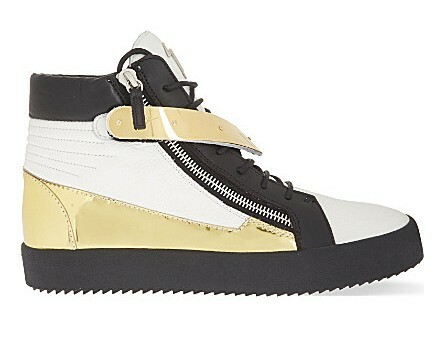 Let me introduce you into the world of the sometimes weird, but always wonderful Giuseppe Zanotti sneakers collection. With some of the most elaborate designs to grace our feet available today, but be warned these are not for the shy wallflowers when it comes to clothing choices. Giuseppe Zanotti’s footwear collection is bold and beautiful and designed to be shown off as often as possible with dramatic effect. With various styles available, from high tops to low and a multitude of extravagant material types used from velvet to Swarovski crystals, there’s a wide range of details that will have a shock and awe effect leaving unsuspecting bystanders mesmerised by the artwork on your feet. Every pair of sneakers is made in Italy for that unsurpassed craftsmanship which oozes quality from every perfectly constructed shoe. 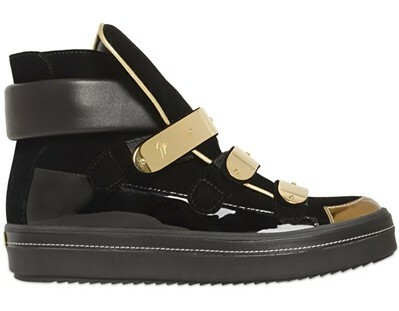 So, here are our top 10 sneakers from Giuseppe Zanotti here on Fashion Runway. Starting off we have this spectacular pair of high tops, sporting beautiful velvet panelling and swarovski embellished velcro straps. One for the more daring among you. A wonderfully futuristic pair of high tops, with sleek lines and gold panelling including a stand out V-strap decoration across the laces. 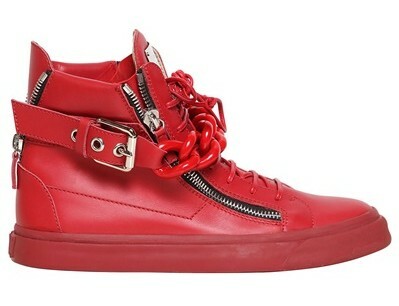 With a large red metal chain across the front of the shoe as the centre piece, this is another unique high top from the Italian brand. With every detail in a fiery red, it’s sure to warm up the coming months. A rather subtle pair of sneakers, but no less fantastic. With a glistening metallic grey leather and zip detailing they will still liven up any outfit. 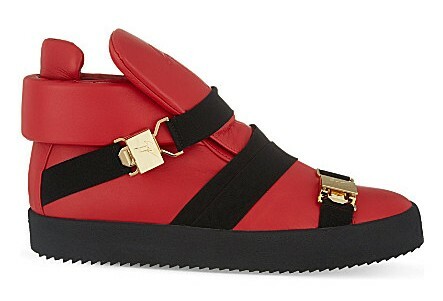 These could be considered a classic in the Zanotti Sneaker collection, being a frequent edition in every season, but you can see why. Vibrant white with croc embossing and gold detailing, a perfect everyday pair. 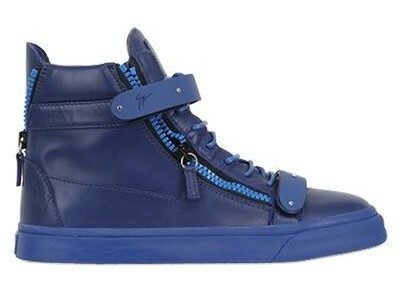 Bold in blue these super soft nappa leather high top sneakers would be a great addition to any footwear collection. With velcro straps and multiple zip detailing. 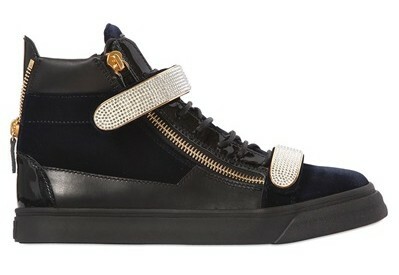 Featuring a silver stud embellished gold plate on the front against the jet black colouring of the leather. This sneaker is another head turner that will get people talking. Breathtaking blue with a metallic sheen, you will simply sparkle walking the streets this fall when you adorn your feet with these Zanotti Sneakers. Striking in black and gold with metal plaque straps combined with velvet and a patent leather outer, these are a fabulous pair of high tops when you want your feet to shine. Saving one of the most outlandish until last, with a red leather padded look and wraparound black straps with gold clasping. Don’t miss this pair if you want to be the talk of the town. Fashion Runway is a luxury and designer fashion blog covering the latest trends and news, designer shoes, designer bags, haute couture and more for both men and women from the likes of Chanel, Louis Vuitton, Celine, Marc Jacobs, Hermes and other designer brands. Keep up to date with the catwalk trends during fashion week, the up and coming designers collections to buy and more. A luxury fashion blog with ease. Enter your email address to subscribe to the Fashion Runway newsletter as well as receive notifications of new posts by email.